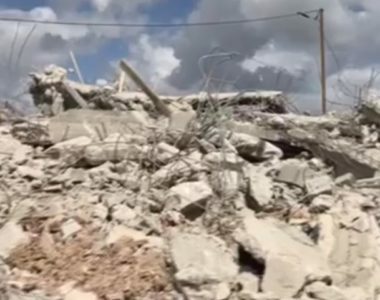 Israeli soldiers demolished, on Wednesday morning, an under-construction home at the entrance of Jabara village, south of the northern West Bank city of Tulkarem. Eyewitnesses said dozens of soldiers, accompanied by two armored bulldozers, invaded the village after surrounding it, and demolished the property. They added that the demolished home is one of many buildings the army intends to destroy under the pretense of being constructed without a permit from the Israeli “Civil Administration Office,” the administrative branch on the illegal military occupation of Palestine. The soldiers closed and encircled the village, especially its eastern and western entrances, and prevented the Palestinians from entering or leaving it. It is worth mentioning that the military only informed the owners of the homes of its decision to demolish them a week ago.